Start by making the vegan egg. 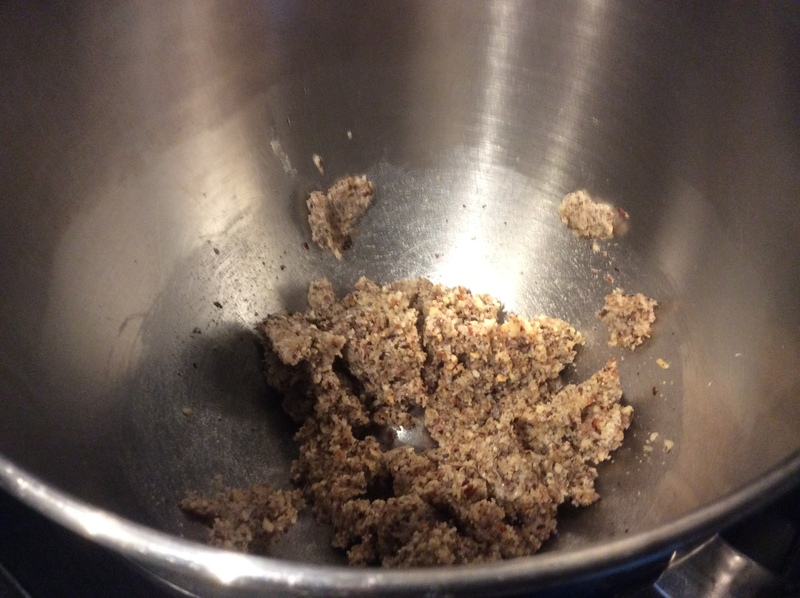 Grind the linseeds in a coffee grinder till you have a fine powder. Tip the ground linseeds into a small bowl and add the 3 tablespoons of water and mix, leave to stand for about 5 minutes and mix again. The linseeds and the water combine to make a gloopy paste which as almost the same cooking properties as an egg. Then add all of the dry ingredients, flour, baking powder and oats. Before you start mixing add 4 tablespoons of cold water. Then mix. If the mixture looks a little bit dry add some more water 1 tablespoon at a time. You are looking for a sticky well combined mixture (don't go mad with the water as you don't want too wet a mixture). Roughly chop the dark chocolate into chunks and mix into the cookie batter. Pre heat the oven to 170 degrees centigrade. Line 2 baking sheets with silicon mats or baking paper. Using a spoon make cookies approximately 2 teaspoons big (1 desert spoon in English). 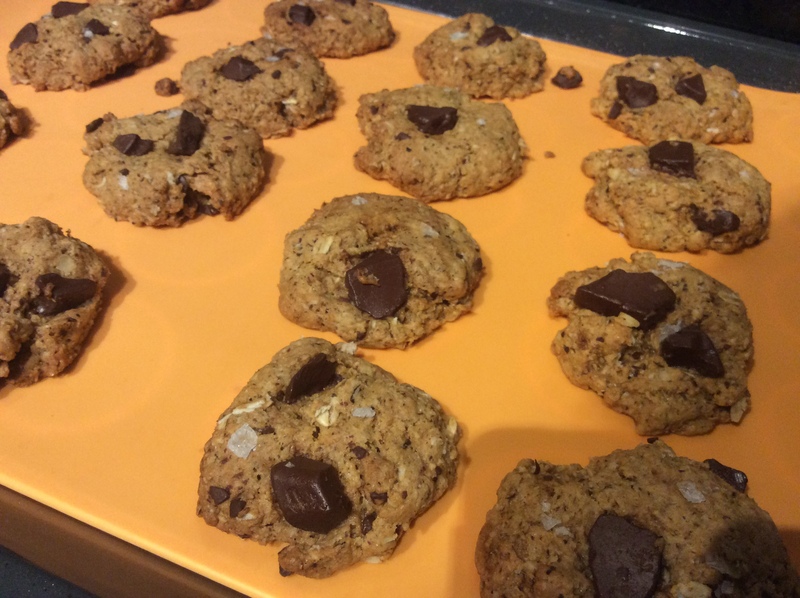 Roll in your hands and flatten down to get a cookie shape. Place the cookies with a bit of room to spare on to the baking sheets. Repeat until you have used up all the mixture. 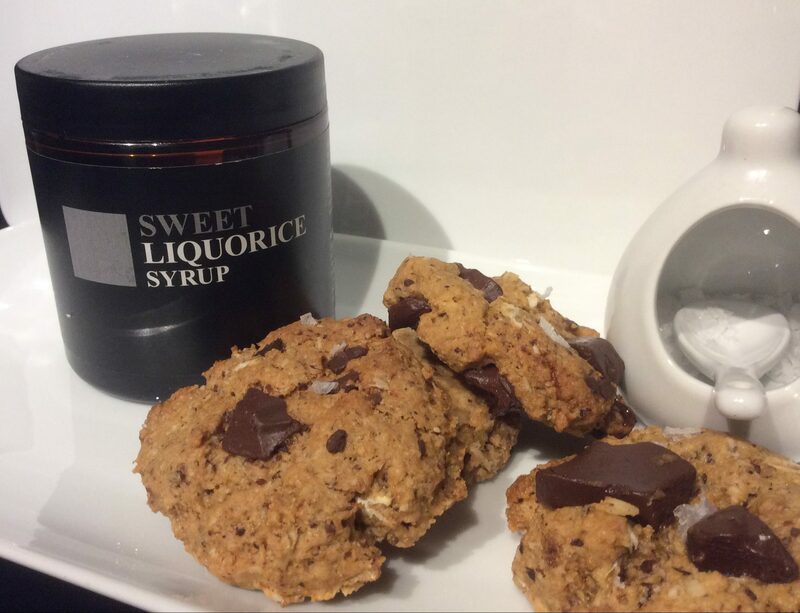 Optional step - I like a bit of a salty kick on my cookies. If you do too carefully put 2 to 3 small sea salt flakes on to each cookie before baking lightly press down so that they stick. Bake in the oven for 18 to 20 minutes. They should still be a little bit soft when they come out. They will harden up on cooling. Leave to cool for out 10 minutes before cooling fully on a wire rack. If you are too impatient they taste great whilst they are still warm. Once cool store in an airtight container. 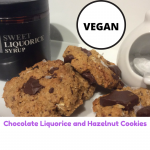 Chocolate Liquorice and Hazelnut Cookies with a hint of sea salt. Don’t tell anyone they are vegan as well, not that you would know it. I haven’t told my boys as it would have put them off trying them. They are Inspired by Johan Buelow’s liquorice shop I bought a jar of his sweet liquorice syrup. This is the second thing I’ve made with it, these are really yummy. 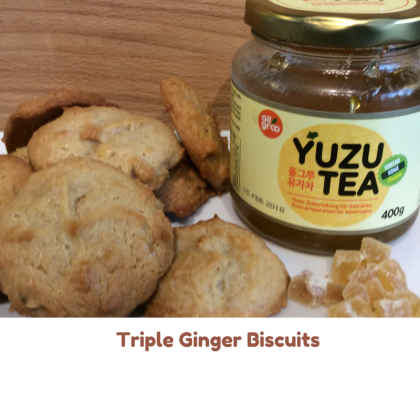 The liquorice flavour is quite subtle but it really makes a delicious cookie. 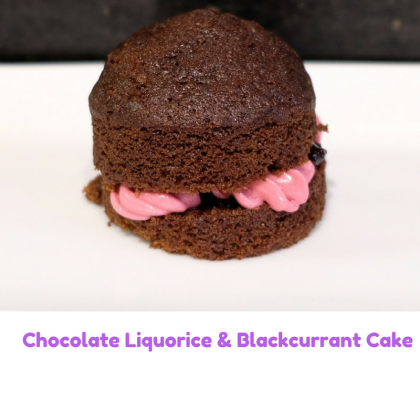 The first thing was these Chocolate Liquorice and Blackcurrant Cakes are right up there with one of my favourite cakes ever, they really are that good. 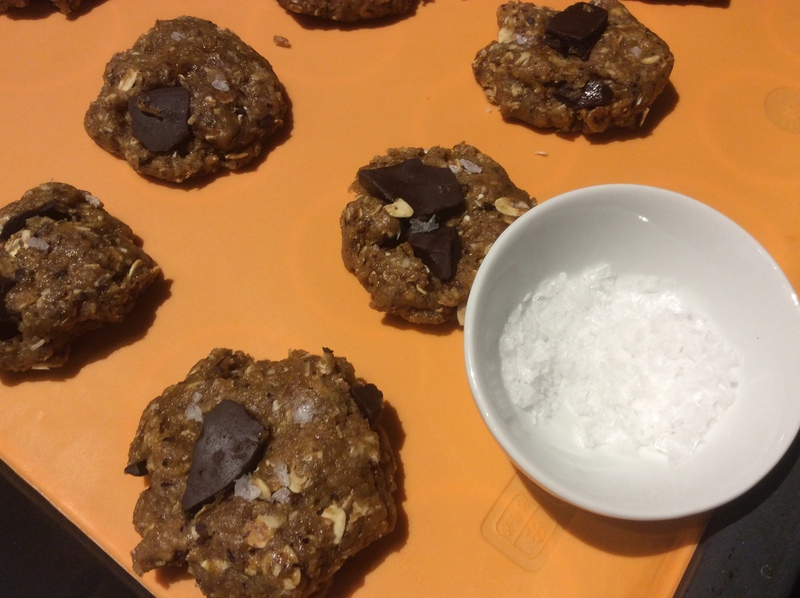 To make the cookies vegan I have replaced the egg with 1 tablespoon of ground linseeds and 3 tablespoons of water. It is not normally possible to buy ground linseeds because they go off quickly once they are ground. I buy the whole seeds and grind them in a coffee grinder. If you aren’t that bothered with a fully vegan cookie and if this is too much hassle you can always use one medium egg instead. 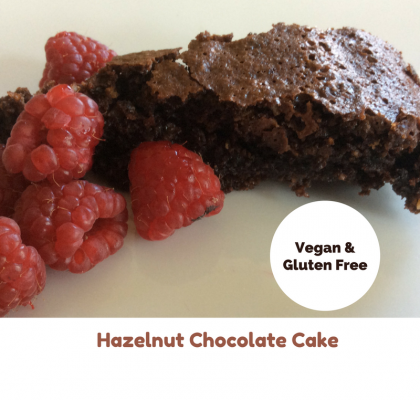 I have used ground hazelnuts in this recipe, for a more subtle taste you could use ground almonds instead or to increase the flavour grind your own walnuts. I hope you like these cookies too.